This is the sixth article in a series on the MINERνA neutrino experiment. The detector for the MINERvA experiment is unlike the super-sized detectors for neutrino experiments such as MINOS and MiniBooNE at Fermilab, or SuperKamiokande in Japan. Instead of striving for the maximum amount of detector mass to catch a maximum number of minimally-interacting neutrinos flying by, MINERvA essentially uses the design of a collider detector: precision measurements and tracking in the center at the interaction point, then particle absorption in thicker and thicker layers radiating outward. The unique detector is a reflection of the unique MINERvA set-up, within point-blank range of the high-flux NuMI beam in the tunnel for the MINOS near detector. "The design is a function of having so many neutrinos to work with," says experiment cospokesperson Kevin McFarland. "We can choose to study in exquisite detail only the interactions that originate in its center. Then as we go outward, like a collider detector, we have an electromagnetic calorimeter, a hadron calorimeter and a muon-catching device, which in this case happens to be the MINOS near detector." MINERvA has an important distinction from hadron collider detectors: its central tracking detector is also the target material for the neutrino interactions. The tracker-target is composed of 25,000 strips of segmented scintillator, triangular in shape, produced at Lab 5 by the Fermilab-NICADD (Northern Illinois Center for Accelerator and Detector Development) scintillator extruder facility. "The triangular extrusion concept was first used by DZero for our central and forward preshower detectors," says Alan Bross of PPD-Experimental Physics Projects. "That project was done with an outside vendor." Bross added that the application to MINERvA arose from a conversation with McFarland at a meeting in 2002. At Lab 5, a co-extruder was recently added to the line in order to produce scintillator strips with a white reflective coating for MINERvA. The development phase for the triangular extrusion is nearly complete. Anna Pla-Dalmau, leader of PPD's Scintillator Detector Development group, described two major challenges: "One was in controlling the cooling profile to avoid stresses which result in bowing of the strip. The other was to achieve a reasonable hole size for the wavelength-shifting fiber which will be glued in the hole." Now the scintillator efforts are focusing on the rectangular extrusion that MINERvA will use in its outer detector. Maria Florencia Canelli, a recent doctoral student at the University of Rochester, won the American Physical Society's 2005 Mitsuyoshi Tanaka Dissertation Award in Experimental Particle Physics. Her dissertation, completed in 2003 at Fermi National Accelerator Laboratory in Batavia, Ill., under the supervision of Thomas Ferbel, professor of physics at Rochester, bested all other doctoral theses from around the world. The Tanaka Award recognizes exceptional young scientists who performed outstanding original doctoral work in experimental particle physics. "Florencia was an inexhaustible bundle of energy and great fun to work with during her graduate years," said Ferbel. "Her development at Fermilab has been quite breathtaking, and she continues to impress me with her determination, her vigor, and her insights." STAR Line to Link Fermilab to Western Suburbs? Hoffman Estates, IL- At last Thursday's STAR Line Task Force meeting, business and community leaders from throughout the western suburbs met with civil engineers and Metra representatives to discuss plans for the proposed STAR Line rail, which would run from Joliet to O'Hare airport, connecting a number of west-suburban cities and business destinations, including Fermilab. Though the line is not likely to be finished for another 10-12 years, David Kralik, Star Line project leader, was optimistic. "Right now there is nothing to show except paper," he said. "But this is, in many ways, the most critical part of the process. I want everyone to understand that the project is moving forward." 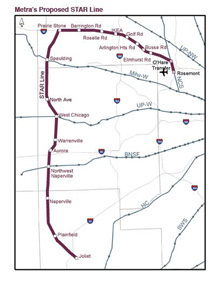 Currently, Metra is conducting a number of studies to present to the Federal Transit Administration and Congress in order to secure funding for the new line. If the STAR Line is constructed, it will connect over 100 communities in Cook, Dupage and Will counties. "1.6 million people currently live here, and there are 800,000 jobs in the northwestern corridor alone--that's 20 percent more jobs than in downtown Chicago," said Brad McGuire, CEO of Jackson Moving and Storage and co-chair of the STAR Line Business Alliance. "If you live here now, you pretty much have to drive to your destination; that creates a lot of congestion." Tony Smith, senior project manager for the consulting firm examining the design and location of future rail stations along STAR Line, said that strategically-placed stations might help revitalize wilting downtowns, like the city of West Chicago, while stations placed at business hubs, like Fermilab, will help decongest roadways. The area being considered for the Fermilab station is near the Batavia Road site entrance. "Fermilab is a huge employment destination," said Smith. "It should be one of the beads on the string." NALWO is for all women associated with Fermilab (and their families). Check out our web page for more information. Fermilab women are welcome to bring guests from outside the Lab community to NALWO activities and we are open to suggestions. Would you be interested in attending NALWO events if they were held in the high-rise? Is there an activity you would like us to add to our schedule? Contact us at nalwo@fnal.gov with new ideas or to let us know how we're doing. We are always happy to hear from you. You can also visit us at the Fermilab Club Fair on Wednesday, April 12 in the Wilson Hall atrium. Get acquainted, share ideas, and make new friends. See you there!